The bare case. Really bare. Cute little ITX board, but the HSF was a massive pain to install. 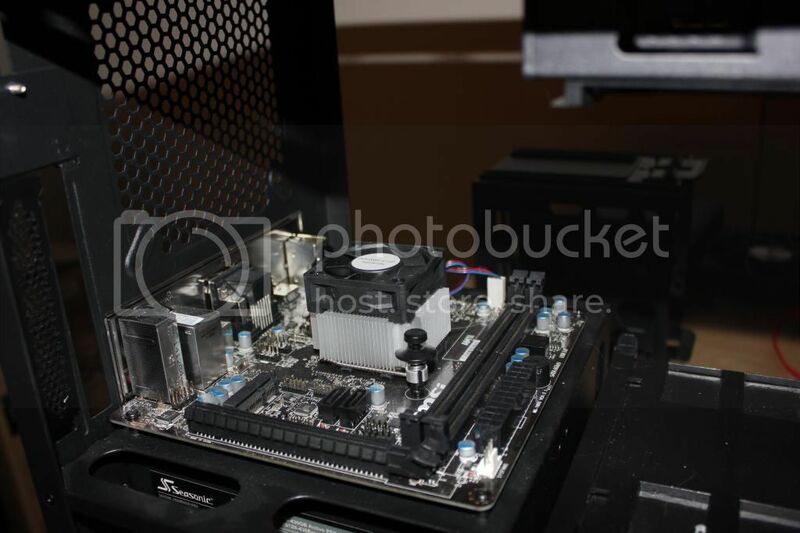 Why oh why did AMD create a new mounting system? Oh well…. The star of the show - Dell PERC 6i raid card installed. Perc wired through the UNUSABLE 5.25 bay and down the front edge of the case. 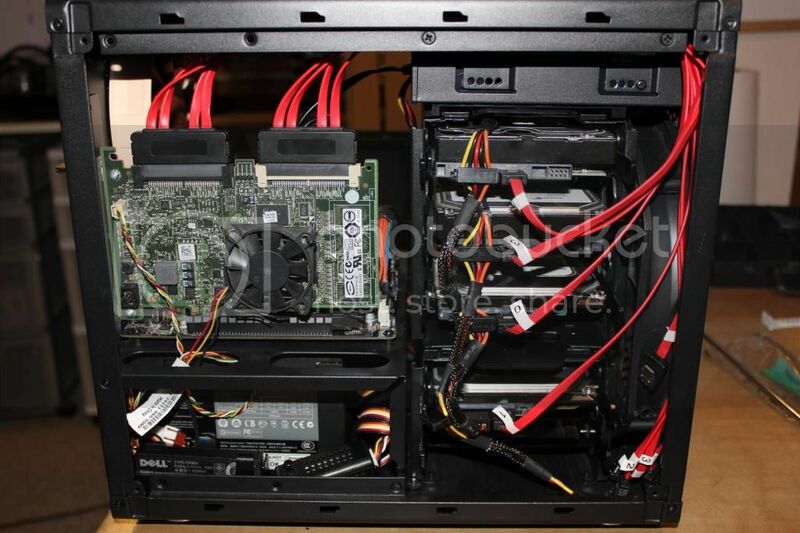 4x Hard drives installed and wired up in Raid 6. 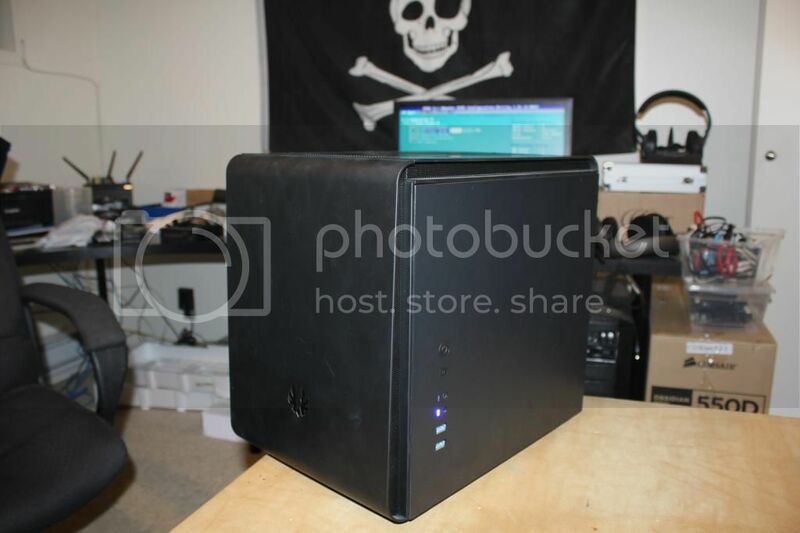 The Prodigy ITX case is fun in most ways, but can be a headache in others. 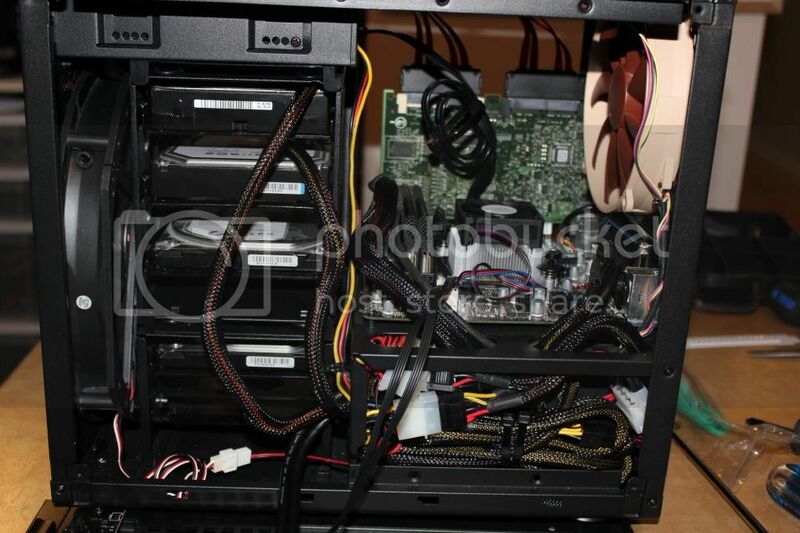 For example, there is ample room for 6x hard drives in the provided hard drive cages, wired to either side of the case. However, your fan options are limited to 1x 120mm, 1x140mm or 1x 220/230mm. 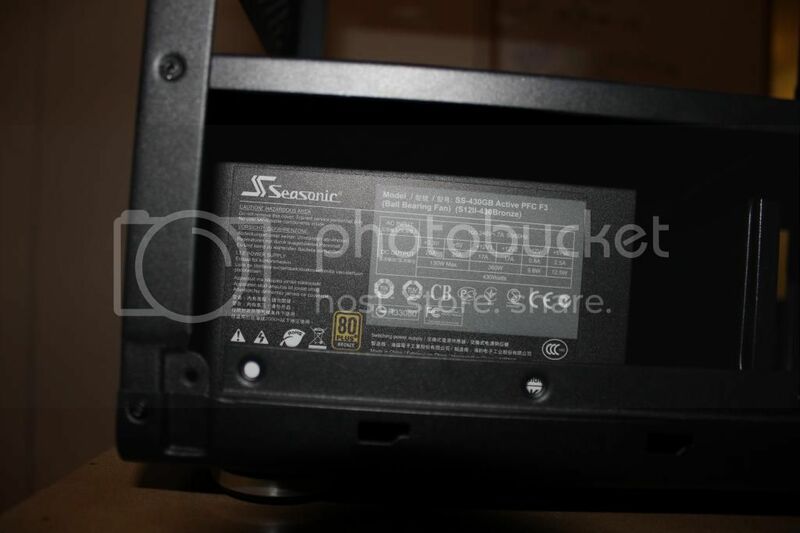 The problem is that the bottom of the (again) Unusable 5.25'' drive bay supports the top of the hard drive cage. The 5.25'' bay can be completely removed of course, which will allow for double the 120 or 140mm intake fans at the front. But in doing so, the upper hard drive cage cannot be mounted, and you're left with a paltry 2x 3.5 drive bays at the bottom of the case. 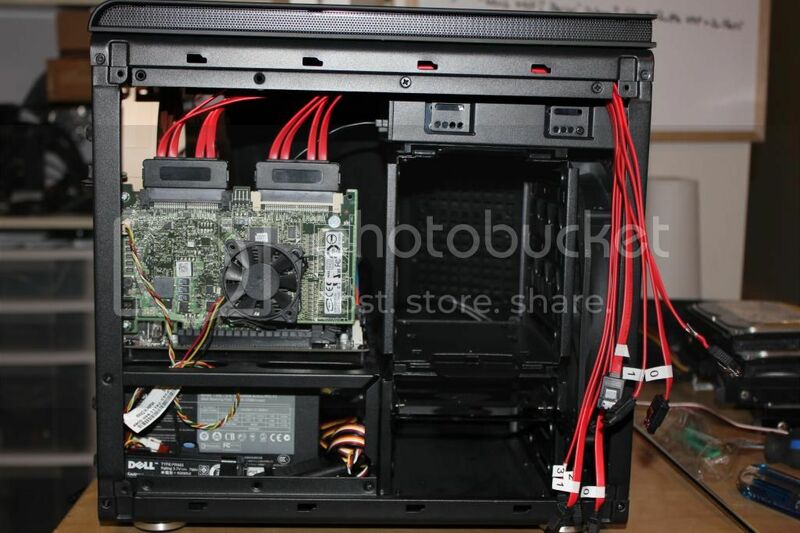 Yes, technically 2.5 drives can be mounted on right side panel - but all the case buttons, USB ports, LEDs, etc are all already on that same side panel, which can make wiring difficult at best (I personally HATE sidepanel wires in general). There is space for 2x 120mm fans on the top, and an additional 120/140mm back case fan as well - so cooling for most mid-range systems shouldn't be an issue. 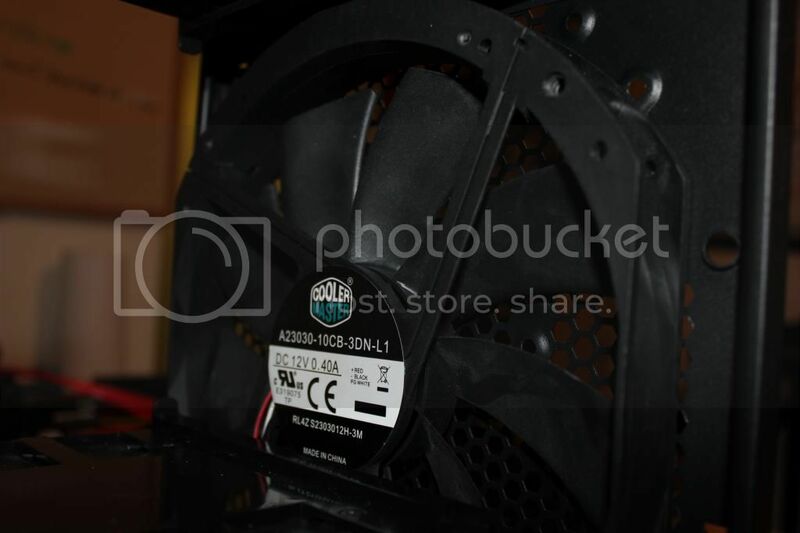 One more small gripe here though: the 120mm fan mounting bracket for the top two fans is placed too high to fit a standard-thickness fan between it and the top removable mesh grill. 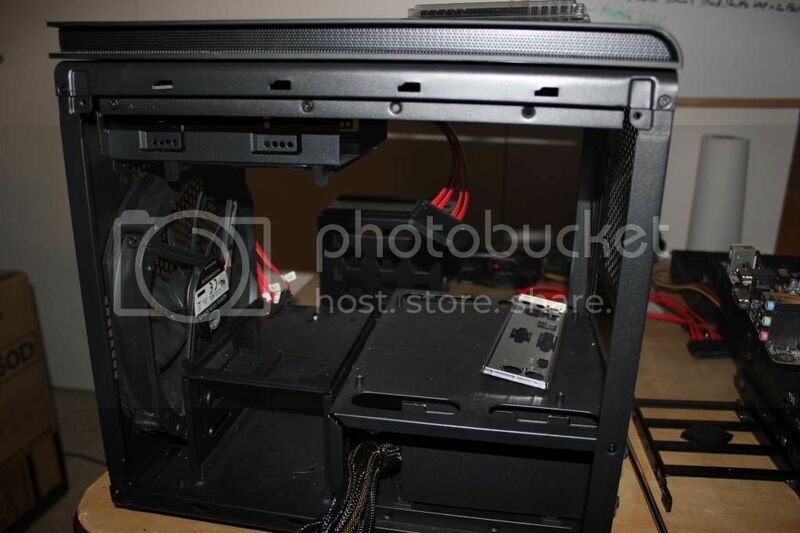 this pushes the two 120mm fans down lower into the case as the only mounting option. And for you water coolers out there, this means nearly a 100% change of ditching your 5.25 bay (and the top hard drive cage) to fit a top-mounted 240mm water cooling setup. The whole build took me about two hours, including scrounging for acceptable noise-level fans (did you see the "dead-fish" exhaust fan?) and working out a few other issues here and there. 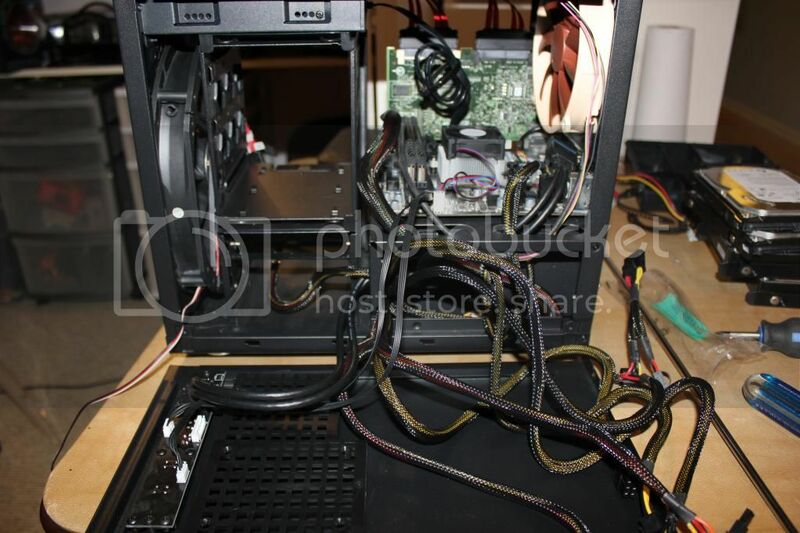 If I were to do this build again, I'd consider one of the Lian-Li cases that are purpose-built for file server use and have fewer limitations. great little build love the raid card haha. wow .. nice setup …..